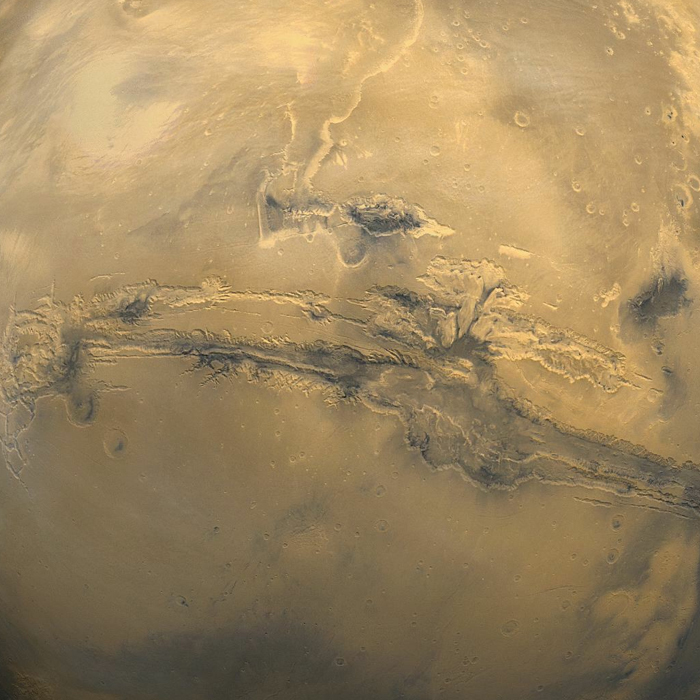 Mars is the fourth planet from the Sun and the second smallest planet in the Solar System. Named after the Roman god of war, it is often described as the "Red Planet" because the iron oxide prevalent on its surface gives it a reddish appearance. Mars is a terrestrial planet with a thin atmosphere, having surface features reminiscent both of the impact craters of the Moon and the volcanoes, valleys, deserts, and polar ice caps of Earth. Mars is the site of Olympus Mons, the second highest known mountain within the Solar System (the tallest on a planet), and of Valles Marineris, one of the largest canyons. The smooth Borealis basin in the northern hemisphere covers 40% of the planet and may be a giant impact feature. Mars has two known moons, Phobos and Deimos, which are small and irregularly shaped.